Designed as a reporting software by allowing the user to create reports/grids/pivot grids, view reports, web view reports, and also features a command line tool. 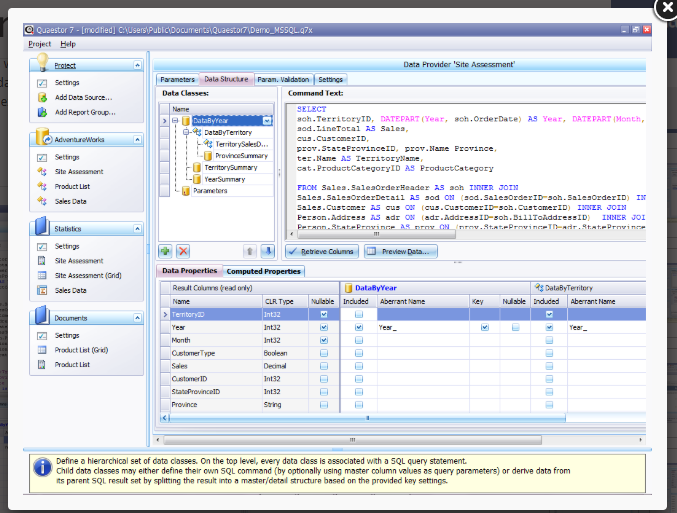 SQL database reporting solution with standalone report creator, report viewer and web viewer applications. Comments: I use Quaestor since more than 15 years, and till today, I didn't faced a task, that I could not solve. ETL I know only by hearsay. Should someone still find followers of this outdated method in their own environment, even their wishes can be fulfilled. The program comes with a compressed documentation, therefore, what at the first glance might be a bit surprising. The first steps are done surprisingly quickly when you choose to explore one of the supplied demo projects in more detail. This is new in version 7 and an absolute improvement on the way to to be on first name terms with the program. The most expensive step is to download and restore the database from the Internet belonging to the demo project. Once done, you can immediately get to know the features. The more profound are the own knowledge of SQL and the deeper knowledge of the data to be evaluated, the greater the variety of reporting options. The Quaestor is not targeted at a specific industry, but is completely neutral in this respect. The performance depends more on the person who uses it. Particularly noteworthy is the separation of application, project and database. A project is a single file. Thus, a roll-out of enhancements, changes or introducing new reports in an application environment variables is simple.